Heroes comes in all sizes, ages, colors, and shapes. Sophia Benner, a 2-year-old from South Carolina, is our hero this week for a simple choice she made with huge ramifications in her hometown Target. According to an Instagram post by Sophia's mom, Brandi Benner, earlier this week, Sophia and her mom went to Target so Sophia could pick out a prize for finishing her potty training, completing one full month of pooping on a toilet. And Sophia knew exactly what she wanted. She went straight to the doll aisle, spent 20 minutes considering her choices, and brought her doll up to the cashier to check out, which is where the problems began. "While we were checking out, the cashier asked Sophia if she was going to a birthday party," Brandi wrote on Instagram. "We both gave her a blank stare. She then pointed to the doll and asked Sophia if she picked her out for a friend. Sophia continued to stare blankly and I let the cashier know that she was a prize for Sophia being fully potty trained." "'But she doesn't look like you. We have lots of other dolls that look more like you,'" the cashier said. The doll was black, and Sophia is white. While Brandi Brenner was getting ready to express her anger at the cashier, Sophia handled the situation expertly. "I immediately became angry, but before I could say anything, Sophia responded with, 'Yes, she does. She's a doctor like I'm a doctor. And I'm a pretty girl and she's a pretty girl. See her pretty hair? And see her stethoscope?'" Brandi wrote. Brenner spoke to CNN about the incident after the Instagram post went viral online. 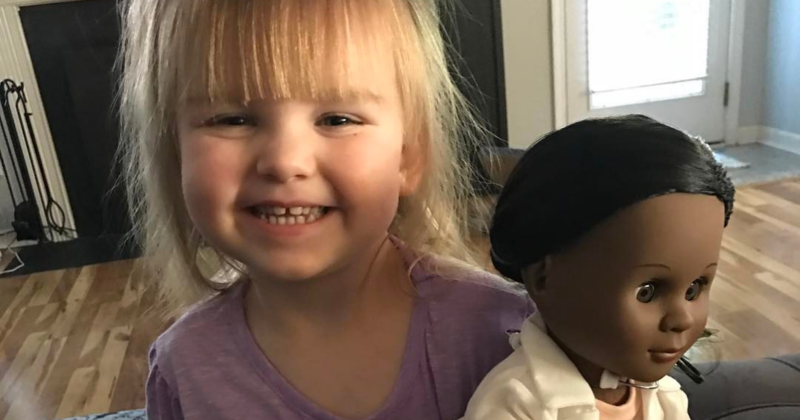 "She kept going back to the doctor doll, because in her mind, she is already a doctor," Benner told CNN. "She loves giving checkups, and if you come in the house, she'll tell you that's the first thing you need." The little doctor's mom said that her daughter wasn't bothered by the cashier's questions, just like she doesn't think much about skin color. "This experience just confirmed my belief that we aren't born with the idea that color matters. Skin comes in different colors just like hair and eyes and every shade is beautiful," she wrote on Instagram. And just like the doll she picked out, Dr. Sophia and the way she sees the world are beautiful too.